Do you enjoy dealing with office politics? Becoming politically savvy is not always viewed as a wholesome, worthy goal. The mere mention of the word "politics" triggers negative connotations. A Senior Finance Manager had said "I refuse to schmooze and manipulate to get ahead". Yet she was frustrated after she was passed over for promotion twice. The two male colleagues who were promoted ahead of her were less qualified, but excelled at politicking. Every month or so, it's girls' night out in Boston. It's not female coeds who are hitting the town, but rather five women who lead IT at local universities. As female leaders in a male-dominated industry, these women can feel isolated. Recently, while giving a presentation at an IT conference, one member of the girls'-night-out group was the only woman in the room. However, for the last four years, these women, along with their invited guests, have been part of a club where they brainstorm ideas, give each other advice and lend support. In other words, they're alone together. At HYPHOS 360, we lead with strategy. Understanding that you have marketing challenges, we always deliver a compelling database solution. We start by participating in your planning process to gain a clear under standing of your objectives and desired outcomes. 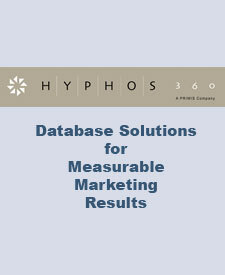 From this viewpoint, HYPHOS 360 becomes your results-oriented bridge between marketing initiatives and information technology. "Executive Presence - How Savvy are Your Business Skills?"